Are you tired of your noisy, leaking air conditioners? A quiet, efficient central air system can be an ideal solution. On average, homeowners spend $4,000-5,600 to install Central AC. The final cost depends on whether or not your house has existing ducts, system size and complexity of installation. Many people are worried about the complexities and the high costs of this upgrade. There is a common misconception that central air can only be put into new construction projects, or homes that have been recently built. In reality, it is possible to install central air in the majority of homes, even old ones, that don’t have any ductwork. While this is not a cheap project, it costs the same or less than many other remodels. Also, cooling your home this way will provide tangible benefits your whole family will feel right away. If there is ductwork already in place, your total installation price for a whole house central air will be very reasonable. For a 1,600-2,000 sq.ft. house, a 2.5 ton central AC system costs $3,900-5,000. Most homes that have a forced air heating system have ducts that can be used for AC as well. If you have a gas, forced-air furnace, an HVAC contractor will put a coil in there for the A/C system and then run the electric to complete the setup. Without unforeseen complications, the install will take 2-3 days. Keep in mind that opting for a more efficient, powerful system can be very expensive. These units can cost $10,000-15,000. The total will depend on the size of your home and the amount of power it takes to cool it. While many older homes have a functioning ducts system in place, it may still require upgrades to accommodate central air installation. If a contractor will need to fix or modify existing ductwork, you can expect to spend an extra $1,000-3,000+. The price difference will depend on the scope of work. Having properly functioning, clean ducts is essential if you want your AC unit to be energy efficient and work at maximum capacity. – Increase the size of the furnace blower (rated in cfm – cubic feet per minute). An undersized blower will not be able to move the right amount of air through the house. Moreover, this can also lead to the coils freezing over. – Seal the air ducts. Leaky ducts is one of the most common efficiency problems in an old home. Air leaks cause cool air drafts during the heating season and and hot air drafts during the cooling season. They also increase your monthly spending on energy costs. How much is central air WITHOUT existing ductwork? Adding ductwork is a labor intensive project that involves cutting into your ceilings, walls and floors. However, an experienced HVAC pro can do a retrofit and hide the new ductwork with minimal disturbance to the structure of your house and very little mess. This is possible today thanks to the advent of modern duct systems, which are both flexible and small in size. As a result, a contractor can easily fit the system inside a small space, such as a closet. Contrary to popular belief, you will not need to do any major construction that may alter the present layout and look of your home. Even 10 years ago, a homeowner would have to live through demolition of certain walls and parts of the house in order to install the ductwork for a new central air conditioner. Today, this is a pretty painless project. There is no reason to overspend on a big central air unit if you actually don’t need one. That’s why the first step in installing central air should be to get a professional pre-installation evaluation or an energy audit. Usually, every 500-600 sq.ft. in your house will call for 1 ton of cooling. However, there are many factors that can impact this general rule. Pro Tip: you should never hire an HVAC contractor who doesn’t do the full manual J calculation, and instead proposes to estimate your system size based on his “vast experience”. Its simply not possible to accurately determine proper air conditioning size based on doing a walk-though in your home. This only speaks to the contractor’s lack of professionalism, and vastly increases the chances of a poor install. When it comes to the cost of the central air conditioner itself, the math is simple: a bigger unit cost more. Roughly, you can expect to spend an extra $1,000 for every additional 800-1,000 sq.ft. of space. The capacity or power of an AC unit is measured in BTU’s (the amount of heat it can remove from a space in one hour). The most popular unit size is 2.5 tons, which is about 30,000 BTU’s. It can cool 1,600-2,000 sq.ft. and costs $3,500-4,300 (includes installation). Here is a run down of the most popular AC sizes, the approximate area it can cool, and estimated installation costs. When selecting a system, its important to consider whether you want it to be single stage or 2 stage. A 1 stage cooling system will turn on at full capacity, when the temperature inside your home will rise above what you have pre-set on the thermostat. Once this happens, it will turn itself off completely, and the process will repeat itself again when it gets too warm. This system is ideal for mild climates that don’t get severe temperature fluctuations throughout the day. 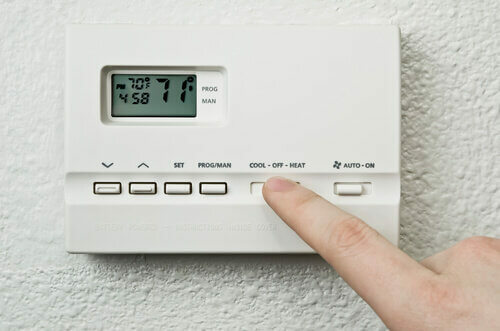 However, if you live in an area with more intense heat, this type of system will have to turn on and off repeatedly in order to maintain the desired temperature. A two-stage unit works differently. It always functions at 2/3 of its capacity. When the temperature rises above what has been preset, the system works up to full capacity and stays on until it reaches the desired temperature. It then goes back to functioning at 2/3 capacity, and then shuts down. This helps save on energy costs, and reduces noise that you hear, if the system has to come on and shut down many times. A 2 stage central air is also known to emit cleaner air, which is very beneficial for people with asthma. When you install a new central air conditioning system, you may discover that there are additional upgrades you need to make. Here are the most common ones. If you live in an older home, you may discover that your existing circuit breaker can not handle the additional load of the central air. In this case, you will want an upgrade to at least 200 amp. A licensed electrician will need to perform this work. Most HVAC contractors partner with an electrician, so you will most likely not need to look for one. Expect to spend $1,200-1,800 to upgrade a 100 amp electrical panel to 200 amp. If there are complications, the cost can go up to as much as $3,000. To avoid unexpected spending, make sure that your electric panel can handle the load of the central AC. If it cannot, you will need to re-evaluate your budget and decide if you want to move forward. It is key to make sure that your home has good insulation. Having poor insulation will have a direct impact on both the short and long term cost of your central AC. First, because so much air escapes, you will need a bigger, more powerful AC unit, which will cost a lot more. Second, you will waste money on operating it more to keep up with the cooling demand. Over the years, this will add up to thousands of dollars. Instead, if your house has poor insulation, tackle this project first. Then, move on to AC. This way you will be able to get a smaller, less expensive central air system, and will spend a lot less on your monthly electric bill. After doing all the calculations, you may wonder if there is any way to save a few bucks on this project. In fact, if you go about this retrofit a smart way, you can save a few thousand dollars. Get a properly sized AC unit: one way to avoid overspending is to get the right unit size. Many people tend to err on the side of caution and want to get a bigger unit, just in case… This is not smart, because in addition to spending more money upfront, you will also be wasting money and energy on running the AC that is too large for your house. Go for high efficiency: buying an energy efficiency AC unit may be more expensive upfront, but it will save money in the long run. First, if you purchase a unit that is 16 SEER or higher, you may qualify for a Federal Tax Credit of $300. These units offer 30% savings on electric bills compared to 13 SEER units, and 60% savings compared to older 10 SEER units. Did you know? SEER is the seasonal energy efficiency ratio, which shows how efficient the unit is throughout all four seasons. For example, it compares the cooling output during the summer vs. the electric input during the summer. Since 2006, the 13 SEER is a minimal federal standard for all central AC units. If you have an older system, you may want to consider replacing it. Our pros recommend installing at least a 14 SEER unit and 16 SEER is BEST. It is possible to get a unit with a very high SEER Rating like 20-24 (24 SEER is the highest). Some HVAC contractors may push you into getting one of these extra high efficiency units, however this may not be advisable. First, because most homes, unless they are located in a region where its never below 95-100+ degrees F, will not need a unit with such high efficiency. Its simply a waste of money. Second, these high efficiency units are known to break more frequently and require expensive repairs – why would you want that? Simpler, lower SEER models are actually more reliable and cause less problems. Get 3 or more estimates: while you may not want to spend time interviewing different contractors, doing this will pay off! HVAC guys charge different rates for their labor and will judge your project based on a number of factors. Many of these have to do with THEIR personal cost of doing business, rather than your house. If you get quotes from 3 or 4 contractors you will see a 15-25% difference in their quotes. Schedule the install during the cool season: once the hot weather sets in, HVAC contractors will have a ton of work. This means that many companies will even jack up their prices a little, just because they can. On the other hand, during the cold months, many companies are a lot less busy, and may be willing to give you a discount of as much as 10%. Depending on the size and construction of your house, you may realize that central air is too expensive. If you live in a very old house, installing new ducts may simply not be feasible. One alternative is to go for a ductless air conditioning system, also known as a mini split. These systems can cool and heat your house, without any ductwork. Thus, this is a great option when central air is not viable. Ductless air conditioning has been very popular in both Europe and Japan for many years. However, it is a fairly new option in the US. It has only been around for about two decades. An estimated 4% of homes in the states use ductless heating and cooling. On average, homeowners report spending $3,500-8,000 to install this system, depending on the size of their house, and the number of cooling zones they want to have. Installing central air is one of the most expensive whole house updates. When you are spending this much money you want to make sure that the job will be done correctly, and will last for many years. Unfortunately, because professional HVAC labor is so expensive ($75-85/per hour), many homeowners are tempted to cut corners and hire a contractor who is willing to offer a discount. However doing this is a really bad idea that will surely backfire. The numbers speak for themselves: according to the data collected by the Environmental Protection Agency, almost 50% of all HVAC installs are done incorrectly! This results in costly repairs and even complete system replacements = thousands of your dollars down the drain. Moreover, a poorly installed system is 30-40% less efficient = more money down the drain every month.